An explosion of sounds. 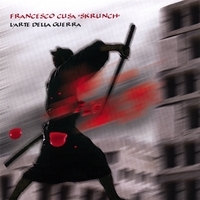 Drums and writings inspired by Sun Tzu: "The art of war"
F.Cusa "Skrunch" played in: F.Cusa "Skrunch" played in: Palermo, Siracusa, Catania, Bologna, Mantova, Trento, Lubiana, Zagabria, Sarajevo, Komen, Pola, Cerkno, Faenza, Imola, Meldola, Wiessbaden, Kranj, Buie, Bisceglie, Siracusa, Ragusa, Tarcento, Ivrea, Grotta Azzolina, Gent, Alessandria, Monza, Roma, Castrovillari, Gorizia, Staranzano, San Marino, Castelfranco Veneto, Livorno, Vittorio Veneto, Mogliano Veneto, Calci, Torino, Trento, Istrana, Lodi, Cesena, Forlì, Ponzano Veneto, Mestre, Venezia, Codroipo, Milano, Mantova, Barletta, Ferrara, Vicenza. "An energetic mix consumed with Sicilian sun, such a lot of mafia, oranges, green lemons rubbed on knees of callow young impudent girls. Butterflys hunting can be a problem exactly as razor on pimpels. Isn't it? For strong palates". The project arise at the end of millenium from F. Cusa who, after years, at last find the two "missing elements" to realize a well developed musical idea. These are compositions that needed a long period of work to be entirely live performed and recorded in studio. "The search of amazing atmosphere, understood as pre-text and therefore false frame and illusory weft, would seem to be the prechosen channel for becoming a vehicle of the musical "contents" of this "Psicopatologia of the Serial Killer". However, a similar affirmation, also with use of the conditional (mood), would give cause for unexpected reflection already to second hearing. The user could in fact be picked from Hamletic doubts about approximately the real intention of Ours of permitting “affabulatio” subordinately regarding musics, because sometimes the roof gutter is replaced by organic remains and viceversa, in a perverse yoke, as perverse is a game for Playstation. The prolapse of hardware and software culminating in the black hole of the communicative "gap", seems to submit to the Playstation like to this cd, in a continuous exchange whose “leitmotif is”: "the communication is the messagge", as obsessively the great puppet showman of this "Grand Guignol" seems impress it on our minds. To this plan gave assens, beyond to more than valid nucleus of the component musicians Skrunch, illustrious names of the prosa too. They have gladly lend their voice to the amazing fresco like a psyco-thriller musical, and among these voices how not notice the extraordinary interpretation of the mythical German Frau Rinciska, or the histrionics of the great voice of the Japanese Saku Ran, coming from the great tradition of the Nu theatre, turned to symbolize the hallucinated deliriums of the psychotic. Last but not least are to be showed the transient "apparitions" of the English Nat All and the American Gay Goldsaint. A very enjoyable product to align to the section "Avant/Jazz-Disconcerting/Grotesque" in your well supplied discotheque. Advised to the lovers of the “musical voyeurism”.